Non-enveloped, head-tail structure. Head is about 50 nm in diameter. The flexible tail is 110 nm in length, contractile. Linear dsDNA genome of about 51-60 kb, encoding for about 80 proteins. The genome is circularly permuted. 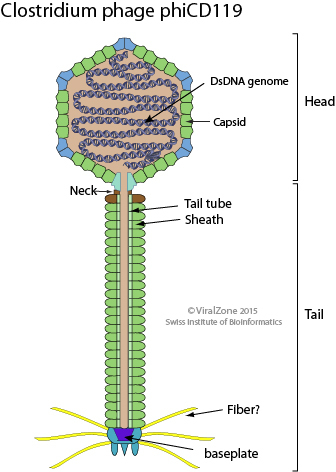 Synthesis of linear concatemers copies of viral DNA. Transcription and translation of late genes.